I got multiple compliments on my dress that I wore to work yesterday. It's an old one, from a few semesters ago. It's faded and stretched from multiple washes and multiple different periods of weight loss and weight gain. But it's comfortable, and I love it, and as one girl said, "you're rocking it." It's funny, in a strange way, for me to have anyone interrupt my day to offer something nice to say, especially from a stranger. But to have more than one person say something ... it really kind of floored me. My default response when complemented is self-deprecation. 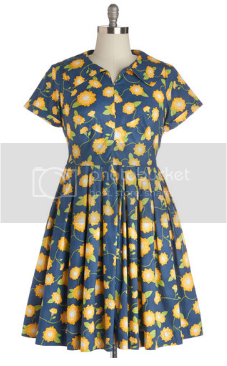 I tell them that it is from ModCloth, but immediately follow that up with "they make normal sizes too." And I never look at their faces to notice the reaction to my turning something so positive into an awkward overshare of my personal issues. It reminds me a lot of a few years ago, before I lost the weight, when I would always have something to say about being slow, or being sweaty, or being out of breath at the top of a flight of stairs. "I don't run unless I'm being chased," said half jokingly but with a feigned air of confidence, as if to make it seem that I was perfectly okay with my struggle. I wasn't, and I'm still not. Although it's much harder now to make progress, I refuse to quit entirely. Without question, the hardest part about the weight regain is not the weight itself, but everything else that came back with the weight. The depression. The loss of self-confidence. The return of that feeling of never quite being comfortable in my own skin, even on my very best days. It's not my husband's fault, at least not entirely. There were so, so many things in the last few years that got me back up nearly all of the weight I'd once lost - not just the pregnancy, not just the failed marriage. But I get so upset sometimes, thinking about how he didn't understand how hard I'd worked to get healthy and how difficult it was for me to turn it back around. He didn't understand the current problem because he had no idea what the problems used to look or feel like. Even still, he has no idea how deeply depressed I was before, or how much I struggle now, and how hard I'd had to work to get as high of a level of self-confidence as I had when I met him. And even that was a work in progress. Once I started caring about myself, it was easier to care for myself. It was an incredible challenge for me then, and it's a harder one now, with my attention pulled in infinitely more directions than it was six years ago when I was single and living alone. Sometimes I feel comfortable and confident, but never fully and always fleeting. I string together a dozen or so good days in a row, then get blindsided by events, news, or feelings that throw me off and leave me cursing at myself: how were you ever strong enough to do this? That strength came from being surrounded by people who held me up when I started to fall, and who believed in me twice as hard in the moments when I struggled to believe in myself. Some of them were local, and many were online, found through blogging. Both sources were people who understood where I'd come from - I'm constantly amazed at the number of emails I get from people who say they found my blog, went back to the beginning, and read the whole thing over a few days (if it were a book, it'd be over a thousand pages, easily). When he found out I had a blog, I begged him not to read it. And he searched around until he found it anyway. And what made me so upset about the whole thing was not just that he read it, but that he only read it from that day on. It was deeply representative of so many of our relationship's problems. He didn't want to know the history, just the present. The struggle never concerned him, because he hadn't been there to experience it first-hand, so it didn't matter. It took a long time for me to take root, to push through the soil, to grow, and then to blossom. All he did was show up, look over the garden, and notice how lovely the flowers were - no concern or care about how it came to be that way. And when the plants started to weather and brown, when the petals fell to the earth and the stems became frail, and he didn't understand how to nourish them back to health, because he had never been a gardener in the first place, just a visitor. He didn't care about the process, just the result. Strangers care so much about my story. The man I married didn't. And I know - I need to let go of this anger, because he didn't care then and he doesn't care now, and it only makes me bitter and sad and deeper in the depressed rut. But - as has become my default mantra for getting through this weird bouts of manic emotional thought - it's hard. It's hard to not think about something at the center of my world right now - especially because this reflection, painful as it is, helps me process and make sense of the bigger picture of everything. My cousin got married last weekend. There are no fewer than a dozen reasons why I wasn't there, the least of which being work/distance. Still, it got me thinking about my own marriage - and in particular, about my wedding. My wedding, like my engagement, was very utilitarian. There was no kneeling, no excited tears, no jewelry to show off in strategically posed photos. And the wedding was just as simple. It was a Tuesday, at a courthouse downtown. The only reason we chose that day was because it was his brother's day off of work, so he could drive down from a few states away to take a few pictures of us. I went to work that morning, we went to the courthouse and then to lunch, and then I headed back to the campus to finish teaching for the day. We did the best we could with what we had. The old courthouse is beautiful, surrounded by live oaks with Spanish moss hanging from the branches. There was no guest drama, no huge poufy expensive dress for one day only, no bills from caterers or DJs. I wore a blue dress I bought a few weeks earlier for work clothes, I held a bouquet of roses I purchased at the grocery store and tied together with a purple elastic band from the previous night's asparagus. He had picked out a ring, which I didn't love, but I loved why he chose it - he's not a terribly emotional man, but the explanation he gave for picking that particular ring was so personal, I loved him for it. After work, I made dinner, and we celebrated with my favorite cheap sparkling wine and a little cake with blue icing roses topped with a bride and groom figurine from the craft aisle at Walmart. Maybe it isn't everyone's dream wedding, but it was mine. Or, mostly, I should say. I guess in the dream, the groom loves me back. He is honest and communicates with me and thanks I'm beautiful even with the scars and the struggles. In the dream, we're getting married for the right reasons, and not because he needs health insurance. The only thing that wasn't perfect about the wedding, was us. We were in such a rush to get married, so we could make the health insurance deadlines. I half jokingly, half seriously suggested getting married at one of the little chapels down by the beach - still small, still just us, but trying to make it as special as eloping could be. He had zero interest. We just needed the paperwork, why waste the money on a ceremony? I didn't want a big fancy dress, but I hoped to wear something other than work clothes. There was one dress from ModCloth, under $100 for a simple white lace dress. But he didn't want to wait for it to arrive. We are in too much of a rush, and why spend more on a dress than we will spend on the certificate and ceremony at the courthouse? So I put on my favorite new work dress, which fit almost everywhere (not up top, as I was still nursing - I couldn't even button it all the way up). And just went along with it. It's hard to look at these pictures that his brother took that day. 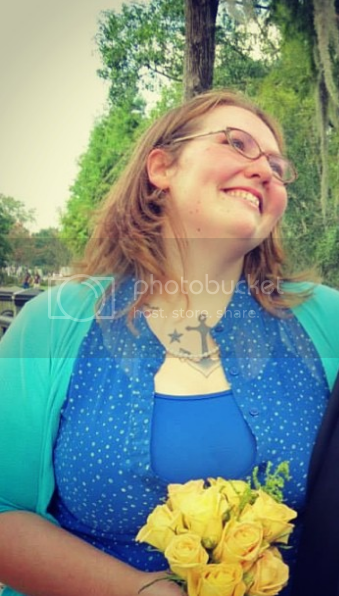 I know what I was thinking and feeling that day, so I can't personally tell if it's obvious - if I look blissfully happy and completely hopeful and entirely in love in the pictures, or if you can tell I know I was making a mistake. I was happy, and I was incredibly hopeful. And I did love him, very very much. But I don't know if mistake is the right word. I knew long-term it wouldn't last. But I also believed that short-term, it was the best choice for my little family. And I honestly don't know what choice I would make if I went back in time and had the option in front of me again, even knowing everything that I know now. I keep saying it, but this time it's finally true: the divorce is so, so close. A final copy of an agreement from us, approval from them, a court date, and it's done. I'm ready, I'm not ready, I don't know what I feel most of the time because it's never 100% anything. I feel sad yet relieved at the same time. I feel angry yet optimistic at the same time. I feel betrayed and yet I still feel love for the person he used to be, the person I agreed to marry even though I knew it wasn't a perfect situation. I knew there would be challenges and struggles, but I wanted to work through them side by side. I had hoped they would draw us closer instead of drive us apart. I think lately, that's what I cry over the most: feeling like a failure for not being able to weather the storm. It wasn't all me, we are both responsible for sinking the ship. But it just hurts to think, what if I'd said this? What if I had done that? Would he have still hurt me? Would he have still strayed? What could I have done to keep us afloat? All the hypotheticals and unanswerable questions make the divorce process so heavy. That there is no one simple answer that gives you that perfect closure you need to settle your heart and shift your mind away from what makes it hurt so badly so often right now. My parents got divorced almost 20 years ago now, and they both confessed to me that they still have a lot of "what might have been" thoughts and moments. It will get easier, but it might not ever disappear completely. Bracing myself for the new forever is exhausting. I've been giving careful consideration to what I wear that day. Partly because I had such little say in what I wore last time I visited the courthouse, and partly because again, it's the end of one part of my life into the beginning of the next. I'm not dressing to impress him, or to try and affect him in any way (not that he'd care even if that was my intention). My husband won't even be at the divorce. He doesn't need to attend for some reason, so it will just be me and the lawyers presenting the judge with the agreement. I'm dressing for myself. I want to look good and feel great and be comfortable and confident as I step into my future. I want to have my picture taken on the same courthouse steps, with the same live oaks and Spanish moss. I want to capture that moment of new beginning. I got married for him. I'm getting divorced for myself. I felt myself disappearing, no interests, no curiosity, no creativity. And I wanted myself back. I gave him everything, and he hurt it and he broke it and he rejected it. Now, I am consciously working on recovery and repair to restore myself to the best possible version I know I can be. It's bigger than my wedding dress - I'm about 50 pounds heavier than I was that day almost three years ago - but right now, that's the last thing on my mind. This is more than a day. This is greater than a dress. 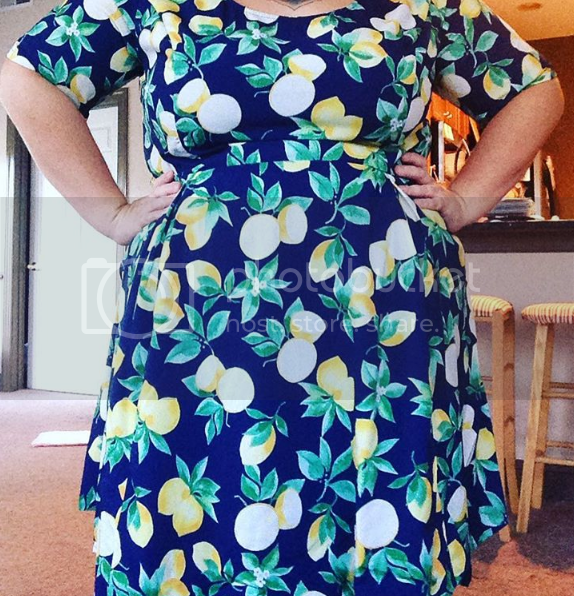 I've been dealt nothing but lemons for the past few years, and this dress is a celebration of just how terrific the lemonade is that I've managed to make - enough sweet to take the edge off the sour, and absolutely, yes, the best is yet to come.